Late Permian Changes in Conditions of the Atmosphere and Enviroments Caused by Halogenated Gases. 2009. L. Weissflog, et al. Dokladi Earth Sciences 424: 818-823. Did volatile halogenated gases from giant salt lakes at the end of the Permian Age lead to a mass extinction of species? The team of researchers found that microbial processes in present-day salt lakes in the south of Russia and South Africa naturally produce and emit highly volatile halocarbons such as chloroform, trichloroethene, and tetrachloroethene. They applied these findings to the Zechstein Sea, which about 250 million years ago in the Permian Age, was situated about where present day Central Europe is. With a total surface area of around 600.000 km2 the Zechstein Sea was almost as large as France is today. The scientists calculated that from the Zechstein Sea alone an annual VHC emissions rate of at least 1.3 million tonnes of trichloroethene, 1.3 million tonnes of tetrachloroethene, 1.1 million tonnes of chloroform as well as 0.050 million tonnes of methyl chloroform can be assumed. By comparison, the annual global industrial emissions of these compounds amount to only about 20 percent of that respectively. 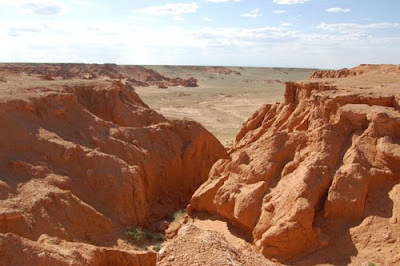 "Using steppe plant species we were able to prove that halogenated gases contribute to speeding up desertification: The combination of stress induced by dryness and the simultaneous chemical stressor `halogenated hydrocarbons´ disproportionately damages and destabilize the plants and speeds up the process of erosion," Dr. Karsten Kotte. 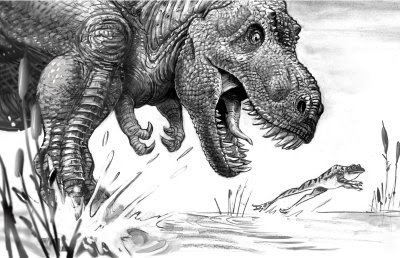 For a couple of years now Mark Schultz has kicked around the idea of contributing a weekly comic strip to the Palaeoblog. Given his busy schedule and other commitments, realistically that’s never going to happen. However, if he did do one it would look like the above. For this strip Mark channels the spirit of Charles M. via Walt Kelly. Paleonauts will appear in Vol. 4 of Mark’s “Various Drawings” series that will be out this summer from Flesk Publications. 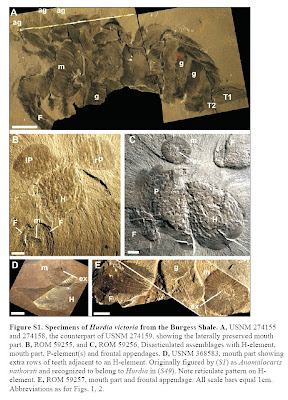 The oldest articulated osteichthyan reveals mosaic gnathostome characters. 2009. M. Zhu, et al. Nature 458: 469-474. Abstract: The evolutionary history of osteichthyans (bony fishes + tetrapods) extends back to the Ludlow epoch of the Silurian period. However, these Silurian forms have been documented exclusively by fragmentary fossils. Here we report the discovery of an exceptionally preserved primitive fish from the Ludlow of Yunnan, China, that represents the oldest near-complete gnathostome (jawed vertebrate). The postcranial skeleton of this fish includes a primitive pectoral girdle and median fin spine as in non-osteichthyan gnathostomes, but a derived macromeric squamation as in crown osteichthyans, and substantiates the unexpected mix of postcranial features in basal sarcopterygians, previously restored from the disarticulated remains of Psarolepis. 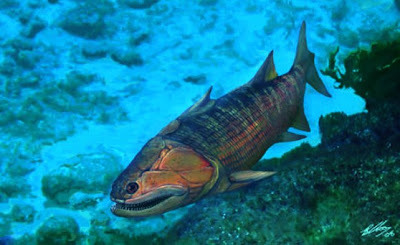 As the oldest articulated sarcopterygian, the new taxon offers insights into the origin and early divergence of osteichthyans, and indicates that the minimum date for the actinopterygian–sarcopterygian split was no later than 419 million years ago. If you’re in the Cleveland area tomorrow (Weds. ), I’m giving a talk on my work in Mongolia at 7pm at the Cleveland Museum of Natural History. Details Here. Shared developmental mechanisms pattern the vertebrate gill arch and paired fin skeletons. 2009. J. A. Gillis, et al. PNAS, published online before print March 24, 2009. The skeleton of any appendage off the body of an animal is probably patterned by the developmental genetic program that has been traced back to formation of gills in sharks. A dearth of fossils prevents us from definitely concluding that fins evolved from gills -- nevertheless, this research shows that the genetic architecture of gills, fins and limbs is the same. The research also showed for the first time that the gill arch skeleton of embryonic skates (a living relative of sharks that has gill rays) responds to treatment with the vitamin A derivative retinoic acid in the same way a limb or fin skeleton does: by making a mirror image duplicate of the structure as the embryo develops. According to the researchers, the genetic circuitry that patterns paired appendages (arms, legs and fins) has a deep evolutionary origin that actually predates the origin of paired appendages themselves. Adam Sedgwich was an English geologist who first applied the name Cambrian to the geologic period of time, now dated at 570 to 505 million years ago. 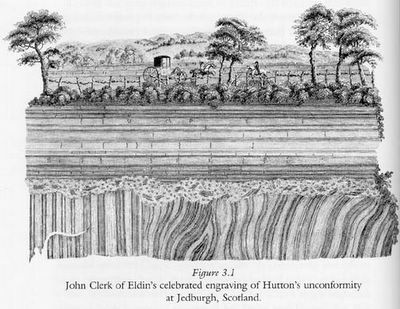 In 1818 he became Woodwardian Professor of Geology at Cambridge, holding a chair that had been endowed ninety years before by the natural historian John Woodward. He lacked formal training in geology, but he quickly became an active researcher in geology and paleontology. Many years after Sedgwick's death, the geological museum at Cambridge was renamed the Sedgwick Museum of Geology in his honor. The museum is now part of the Department of Earth Sciences at Cambridge University. The evolution of the lepidosaurian lower temporal bar: new perspectives from the Late Cretaceous of South China. 2009. Jin-You Mo, et al. J. Exp. Biol. Published online before print March 18, 2009. Abstract: Until recently, it was considered axiomatic that the skull of lizards and snakes arose from that of a diapsid ancestor by loss of the lower temporal bar. The presence of the bar in the living New Zealand Tuatara, Sphenodon, was thus considered primitive, corroborating its status as a ‘living fossil’. A combination of new fossils and rigorous phylogeny has demonstrated unequivocally that the absence of the bar is the primitive lepidosaurian condition, prompting questions as to its function. 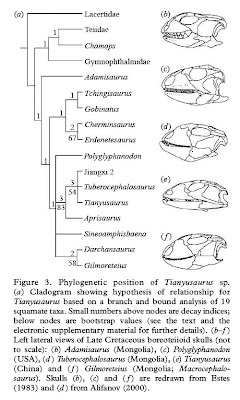 Here we describe new material of Tianyusaurus, a remarkable lizard from the Late Cretaceous of China that is paradoxical in having a complete lower temporal bar and a fixed quadrate. New material from Jiangxi Province is more complete and less distorted than the original holotype. Tianyusaurus is shown to be a member of the Boreoteiioidea, a successful clade of large herbivorous lizards that were dispersed through eastern Asia, Europe and North America in the Late Cretaceous, but disappeared in the end-Cretaceous extinction. 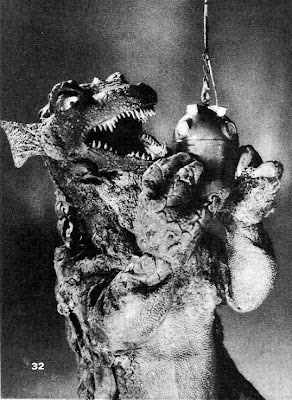 A unique combination of characters suggests that Tianyusaurus took food items requiring a large gape. Hurdia victoria was originally described in 1912 as a crustacean-like animal from the famous 505 million year old Burgess Shale, a UNESCO World Heritage Site in British Columbia, Canada. Researchers have found more pieces of this critter and reconstructed it as a formidable predator. When the first fragments of Hurdia were described nearly one hundred years ago, they were assumed to be part of a crustacean-like animal. It was not then realised that other parts of the animal were also in collections, but had been described independently as jellyfish, sea cucumbers and other arthropods. 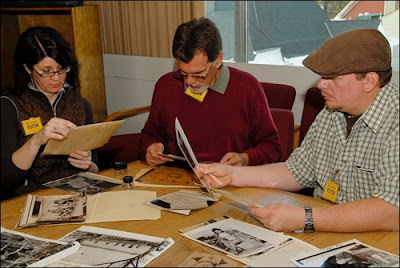 New material collected in the 1990s and the discovery of the best-preserved specimen in the collections at the Smithsonian Museum shows Hurdia to be related to Anomalocaris. Like Anomalocaris, Hurdia had a segmented body with a head bearing a pair of spinous claws and a circular jaw structure with many teeth. But it differs from Anomalocaris by the possession of a huge three-part carapace that projects out from the front of the animal's head. An Early Cretaceous heterodontosaurid dinosaur with filamentous integumentary structures. 2009. 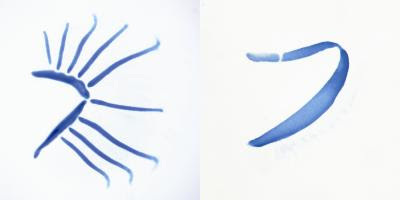 Xiao-Ting Zheng, et al., Nature 458: 333-336. Abstract: Ornithischia is one of the two major groups of dinosaurs, with heterodontosauridae as one of its major clades. Heterodontosauridae is characterized by small, gracile bodies and a problematic phylogenetic position. Recent phylogenetic work indicates that it represents the most basal group of all well-known ornithischians. Previous heterodontosaurid records are mainly from the Early Jurassic period (205–190 million years ago) of Africa. Here we report a new heterodontosaurid, Tianyulong confuciusi gen. et sp. nov., from the Early Cretaceous period (144–99 million years ago) of western Liaoning Province, China. Tianyulong extends the geographical distribution of heterodontosaurids to Asia and confirms the clade's previously questionable temporal range extension into the Early Cretaceous period. More surprisingly, Tianyulong bears long, singular and unbranched filamentous integumentary (outer skin) structures. This represents the first confirmed report, to our knowledge, of filamentous integumentary structures in an ornithischian dinosaur. In 1866, the Peabody Museum of Natural History was founded with a gift from George Peabody. The same year his nephew, O.C. 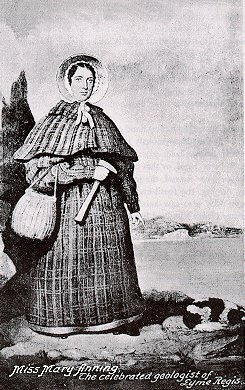 Marsh, was also named its Professor of Paleontology, the first such appointment in the United States. 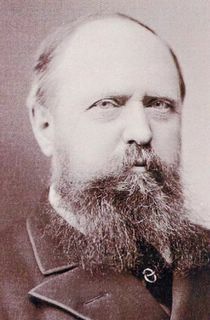 In 1869 Marsh used the inheritance from his uncle to start to amass large collections of vertebrate fossils. He went on to long and successful career as a vertebrate paleontologist, most of which was spent fueding with is rival, E.D.Cope. 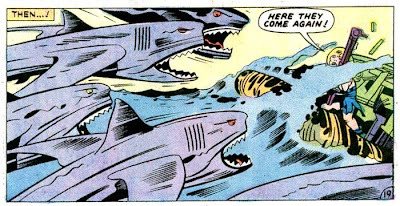 Marsh and Cope started their careers on a cordial basis, but the relationship soon soured over an incident involving Cope's fossil of Elasmosaurus. Embarassingly, Marsh pointed out that its backbones were mounted backwards. To settle the arguement the men agreed to let Joseph Leidy decide who was right. Leidy promptly removed the head from one end and placed it on what Cope had thought was the tail. Cope than frantically tried to collect all of the copies of a recently printed publication that contained his erroneous reconstruction. 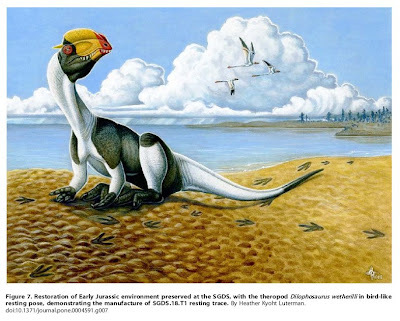 Many of you know Carol Abraczinskas as one of the best scientific illustrators working in the vert palaeo field these days. So, what’s she doing in the top story on the FBI’s website today? 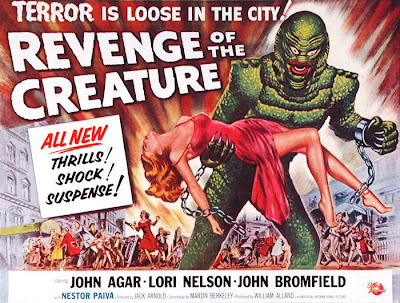 Jack Arnold (Oct. 16, 1916 - March 17, 1992) directed a number of classic SF films including The Creature From the Black Lagoon, Revenge of the Creature, The Incredible Shrinking Man, and It Came From Outer Space, as well as few not-so-classics (but still much loved) such as Monster on Campus. Throughout the ‘60’s and into the early 80’s he had a successful career as a TV producer and director. Researchers have discovered the smallest dinosaur species on the continent to date. Their work is also helping re-draw the picture of North America’s ecosystem at the height of the dinosaur age 75 million years ago. Nick Longrich and Philip Currie describe a new genus of carnivorous dinosaur that was smaller than a modern housecat and likely hunted insects, small mammals and other prey through the swamps and forests of the late Cretaceous period in southeastern Alberta, Canada. 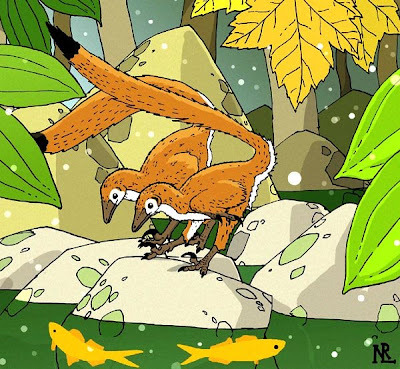 Weighing approximately two kilograms and standing about 50 centimetres tall, Hesperonychus elizabethae resembled a miniature version of the famous bipedal predator Velociraptor, to which it was closely related. Hesperonychus ran about on two legs and had razor-like claws and an enlarged sickle-shaped claw on its second toe. 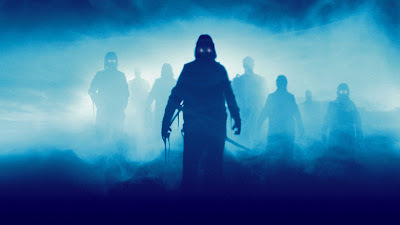 It had a slender build and slender head with dagger-like teeth. 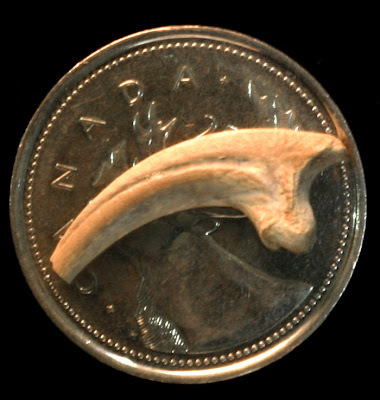 Fossilized remains of Hesperonychus, which means “western claw,” were collected in 1982 from several locations including Dinosaur Provincial Park. 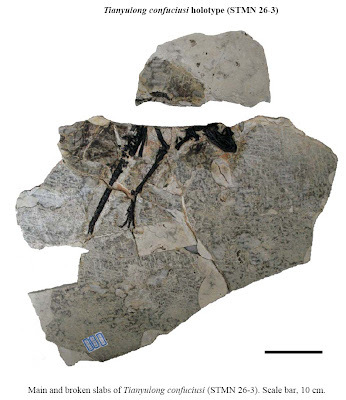 The most important specimen, a well-preserved pelvis (below), was recovered by late Alberta paleontologist Elizabeth (Betsy) Nicholls, after which the species is named. “Hesperonychus is currently the smallest dinosaur known from North America. But its discovery just emphasizes how little we actually know, and it raises the possibility that there are even smaller ones out there, waiting to be found,” said Nick Longrich. 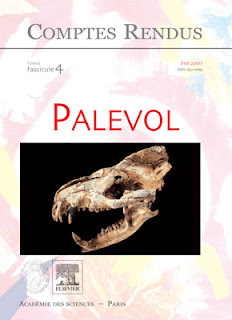 The current issue of Comptes Rendus Palevol, Volume 8, Issues 2-3, (March-April 2009) is a special issue with articles devoted to the Evolutionary History of Life. 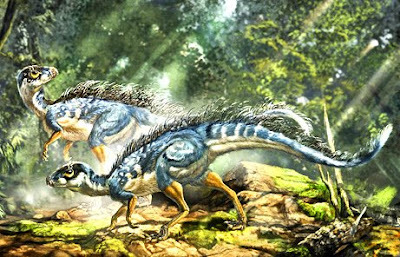 Abstract: Birds are dinosaurs – specifically, small feathered and flighted theropod dinosaurs that probably originated in Laurasia during the Late Jurassic over 140 million years ago. 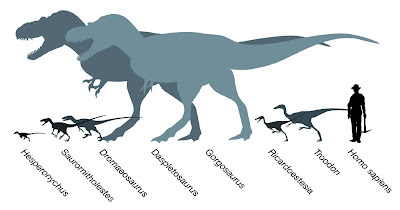 They are most closely related to other small theropods such as dromaeosaurs and troodontids, terrestrial predators that were fleet-footed hunters. The origin of birds is a classic example of two kinds of macroevolution: the phylogenetic origin of the group, and the sequential assembly of adaptations such as flight that are indelibly associated with birds. These adaptations were not assembled all at once. Rather, a great many characteristics associated with birds and flight first appeared in non-avian dinosaurs, where they were used for many purposes other than flight. These included insulation, brooding, and probably display and species recognition. Birds diversified steadily but gradually after their origin, which is identified with the origin of flight (Archaeopteryx); forelimb and other flight-associated features evolved more rapidly than features associated with the posterior skeleton. The first birds grew more slowly than extant birds do, and more like other small Mesozoic dinosaurs; like them, they probably matured sexually well before they completed their active skeletal growth. The origin of flight is not a problem of “trees down” or “ground up,” but rather an examination of the order in which diagnostic flight characters evolved, and what each stage can reveal about the functions and habits of bird outgroups at those evolutionary junctures. Well worth checking out by those who might not otherwise peruse the foreign literature. 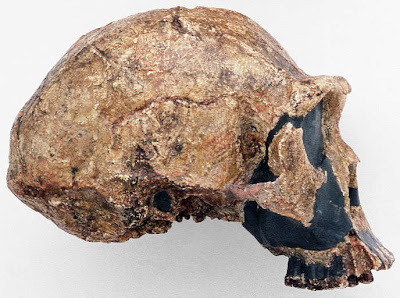 Age of Zhoukoudian Homo erectus determined with 26Al/10Be burial dating. 2009. Guanjun Shen, et al. Nature 458: 198-200. A new dating method has found that "Peking Man" is around 200,000 years older than previously thought, suggesting he somehow adapted to the cold of a mild glacial period. Granger used aluminum-26 and beryllium-10 radioisotopic dating, which is based on radioactive decay in the mineral quartz. As cosmic rays penetrate into rocks at the Earth's surface, chemical reactions produce these isotopes of aluminum and beryllium. If the rocks are then buried, the isotopes are no longer produced and those existing begin to decay. 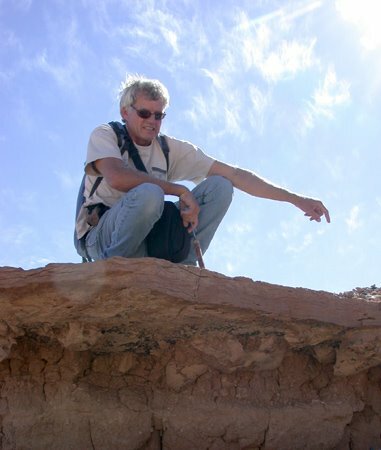 The rate of decay can tell researchers when the rocks were deposited in a site, he said. The site was found to be 680,000-780,000 years old. 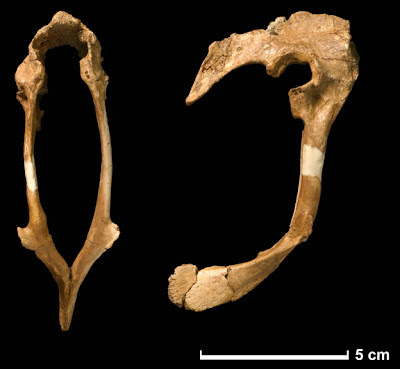 Earlier estimates put the age at 230,000-500,000 years old. FYI, I'm in Alberta at the RTMP until the 16th. Internet access is limited but things will return to normal next week. Abstract : Fossil tracks made by non-avian theropod dinosaurs commonly reflect the habitual bipedal stance retained in living birds. Only rarely-captured behaviors, such as crouching, might create impressions made by the hands. 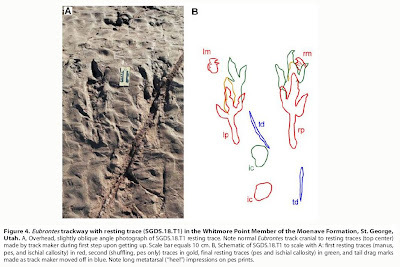 Here we describe a well-preserved theropod trackway in a Lower Jurassic (~198 million-year-old) lacustrine beach sandstone in the Whitmore Point Member of the Moenave Formation in southwestern Utah. The trackway consists of prints of typical morphology, intermittent tail drags and, unusually, traces made by the animal resting on the substrate in a posture very similar to modern birds. The resting trace includes symmetrical pes impressions and well-defined impressions made by both hands, the tail, and the ischial callosity. The manus impressions corroborate that early theropods, like later birds, held their palms facing medially, in contrast to manus prints previously attributed to theropods that have forward-pointing digits. Both the symmetrical resting posture and the medially-facing palms therefore evolved by the Early Jurassic, much earlier in the theropod lineage than previously recognized, and may characterize all theropods. A 300-million-year-old brain of a relative of sharks and ratfish has been revealed using synchrotron holotomography. It is the first time that the soft tissue of such an old fossil brain has ever been found. Using absorption microtomography to study different samples scientists found a peculiar crystalline calcite structure in one specimen of an iniopterygian. 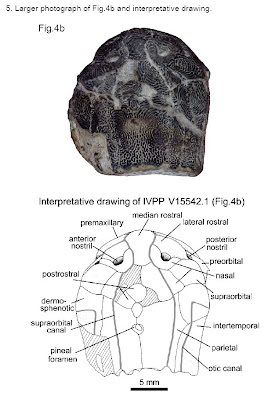 The 3D reconstruction showed a tiny (about 1.5mm by 7 mm in size), symmetrical shape that sits within a large braincase. The brain has a large lobe for vision and an optic nerve that stretches to the correct place on the braincase; both of these features correlate well with the large eye sockets. The auditory section of the brain is reduced, and this information reflects observations of the inner ear in iniopterygians. Unlike typical ear canals that regulate orientation and balance with three big loops, the ear canals in this extinct group are all pulled into a horizontal plane. This means that the fish could detect side to side movements, but not up and down. The only part the researchers couldn't spot was the forebrain, perhaps too thin to become mineralized. The paper will be up shortly at PNAS.org. I’ll update this posting when it appears. 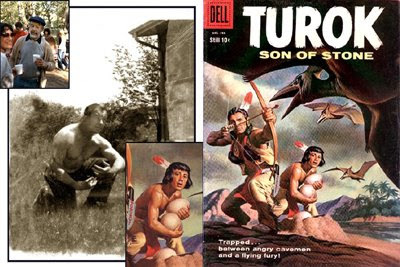 My recent Turok postings prompted Pete Von Sholly to let me know that over at his VonShollywood blog he’s got a long article on Morris "Mo" Gollub who did a lot of the early Turok covers. Pete excerpts a long piece about Gollub from a letter from his son with lots of info. It’s well worth checking out by any fan of Gollub’s great art. Dinosaurs roam the halls at the Los Angeles Natural History Museum. More dinos at Erth.com who make these things. 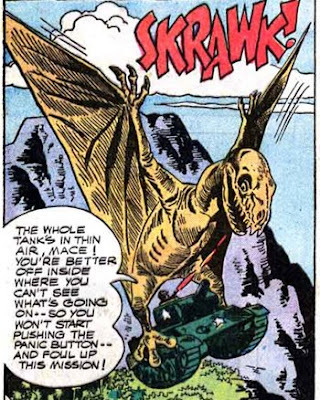 Here's part 2 (and the last half) of Turok's first story.